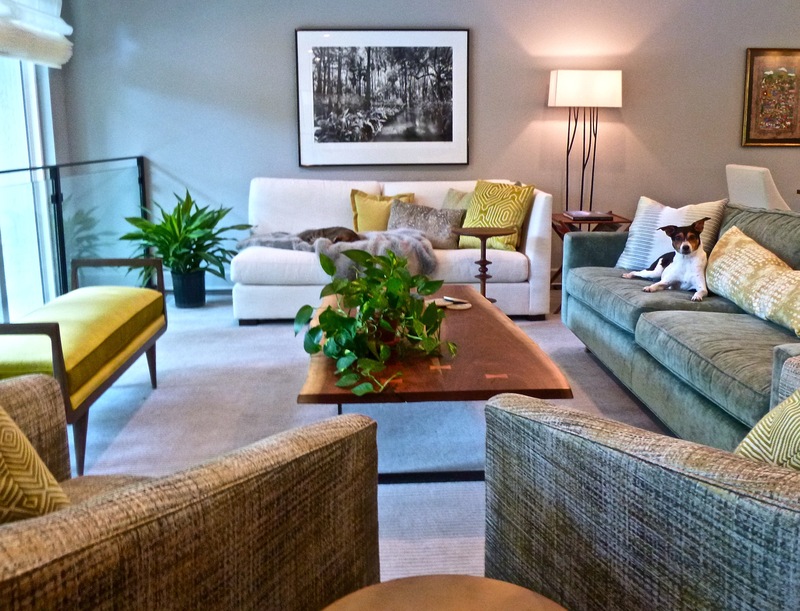 On the upper level of this two story Florida home, multiple shades of green, gold and chartreuse in the upholstery bring the tones of the garden into the living space. 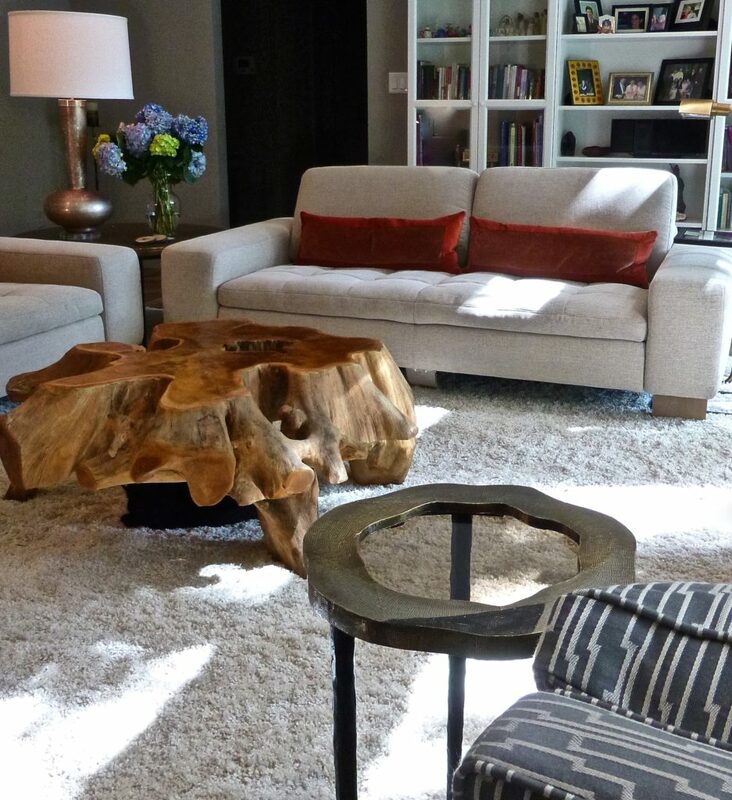 A live edge walnut coffee table and carved walnut accent table add natural warmth, form & texture. 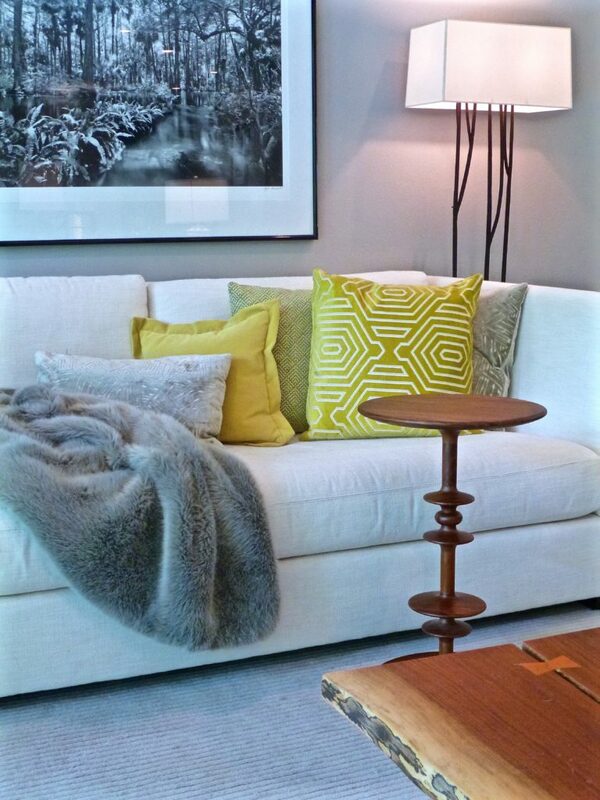 The dark metal branches of the standing lamp and black & white photograph give depth and contrast. 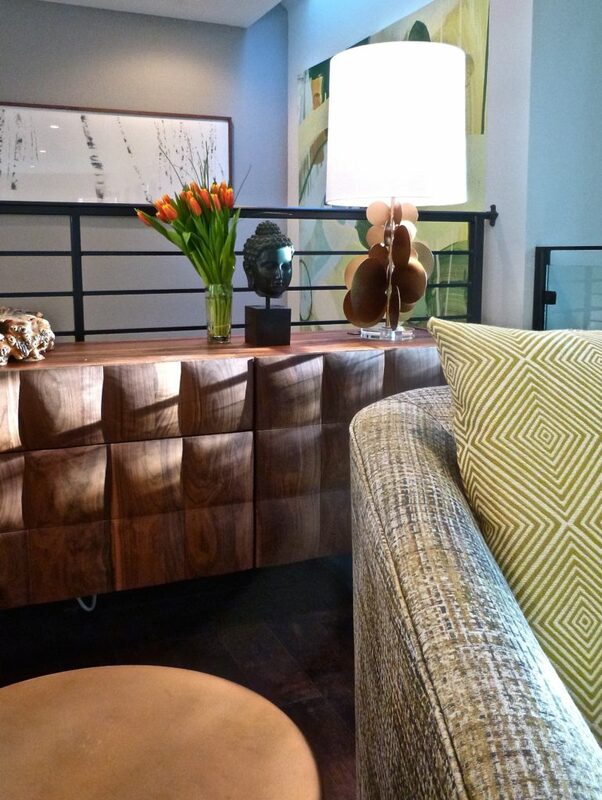 The carved doors of the natural walnut credenza create a rich sculptural dimension while the natural brass discs of a pair of table lamps add a bit of whimsy. 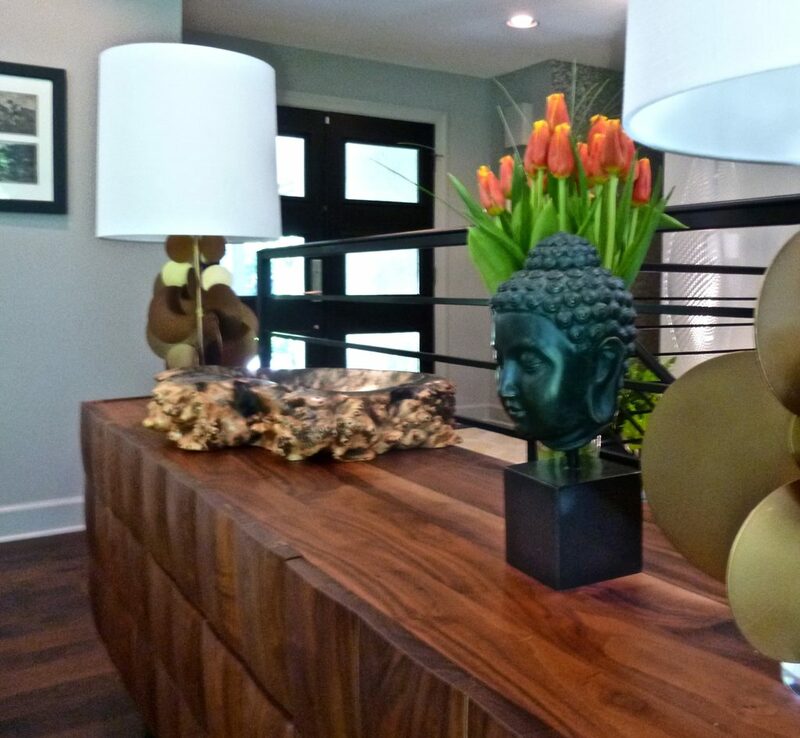 Black accents like the front doors and stair railing punch up the contrast and accent those items while consistent wall and base moulding tone keep the background quiet to highlight the artwork. We removed a solid half wall in front of the upper level Windows and replaced it with glass panels to expose the beautiful view of the pool and Garden below. 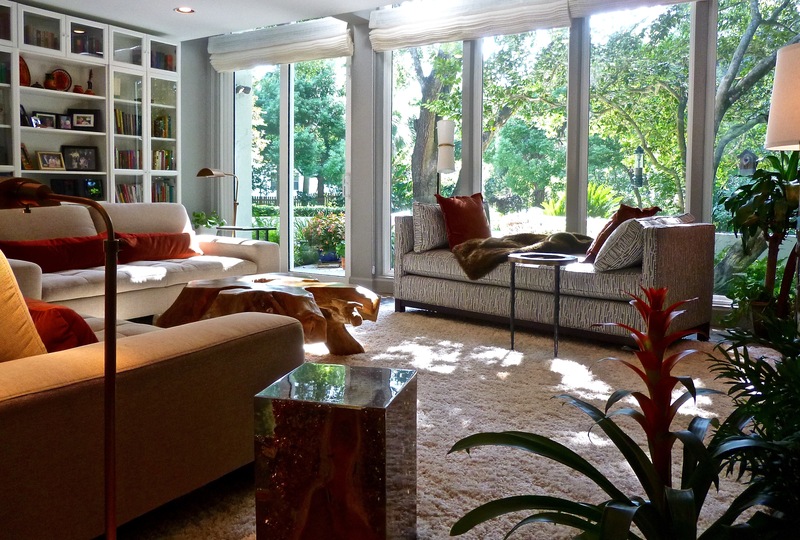 Motorized sheer shades cover double story windows in the evening. 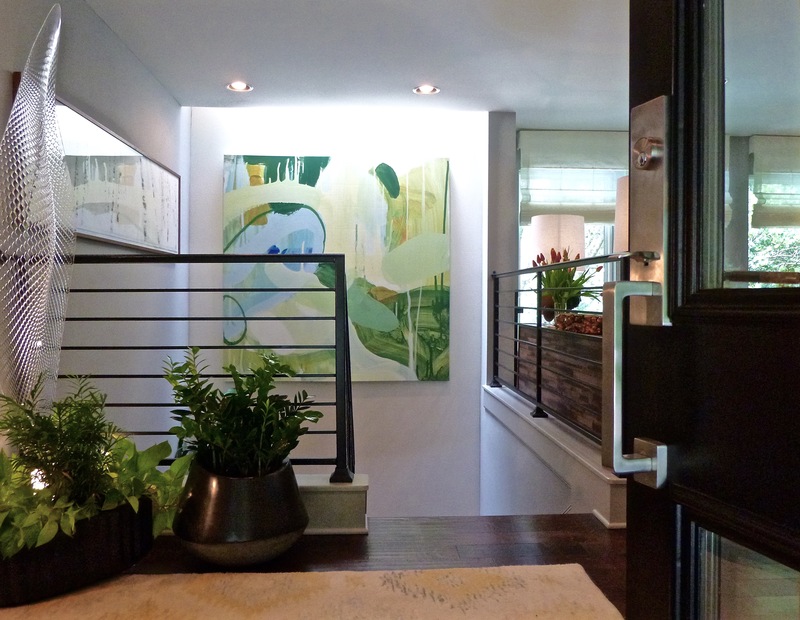 The Entry Staircase leads you down to the lower level living area with the pool and garden outside of the two story window wall. 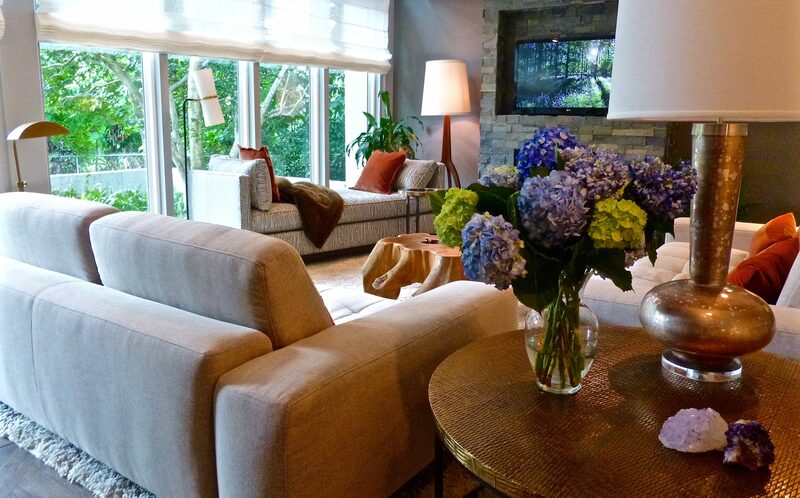 On the lower level a dark and heavy stone fireplace was softened by painting a deep tone on the surrounding wall. 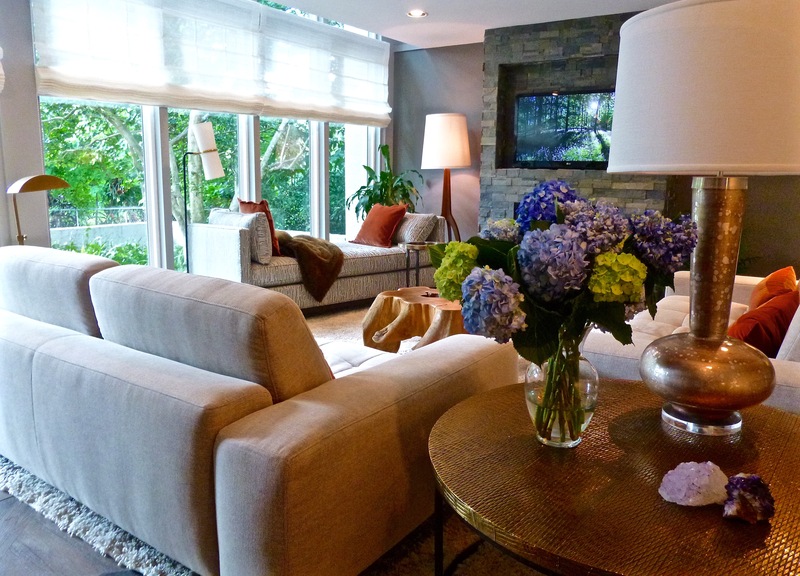 The TV is recessed into the stone surround. The wall of windows continues from above and provides a great view of the pool. 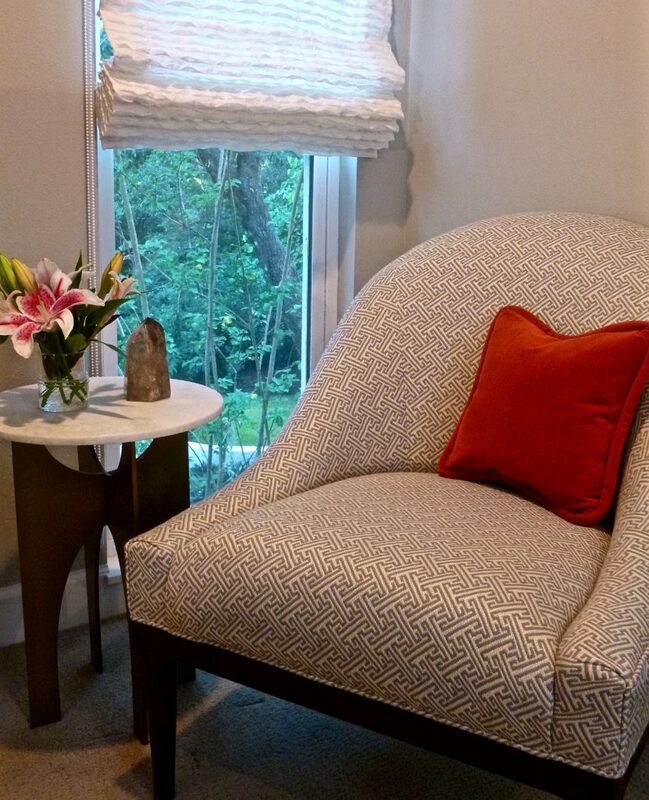 A double chaise in the window is a perfect spot for reading or watching the outdoor activities. 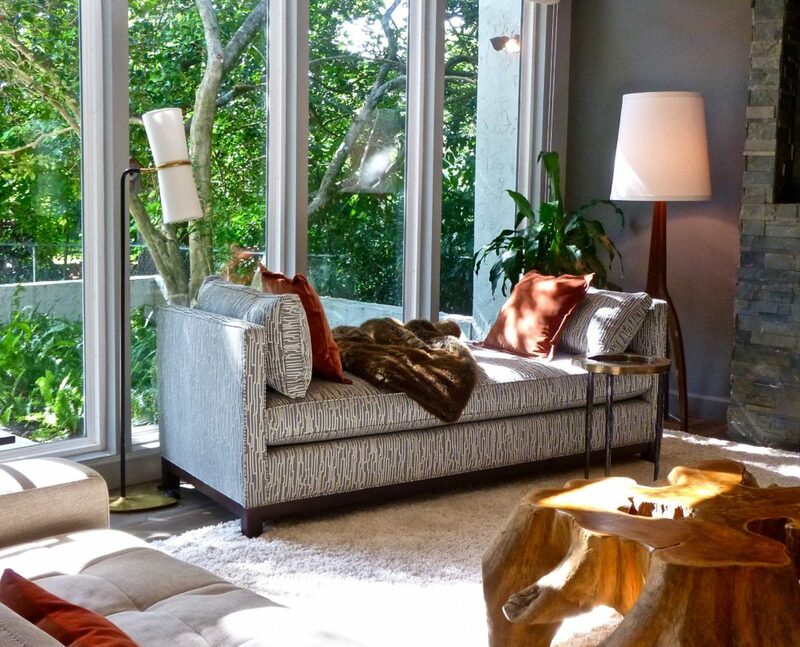 A standing lamp at one end of the chaise provides sculptural interest and light for reading while the large shaded lamp at the other end provides strong general lighting in the evening. 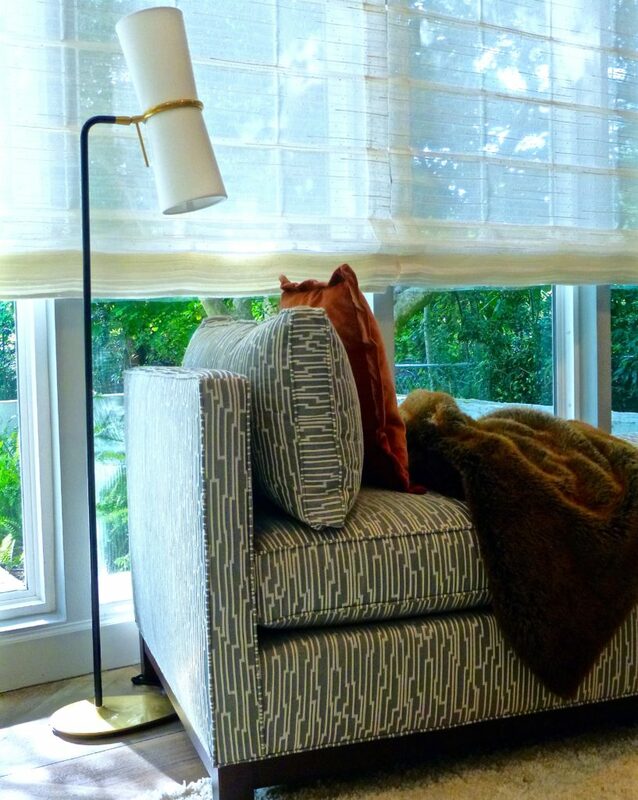 Patterned sheer linen shades filter the light in the day and provide some privacy in the evening. 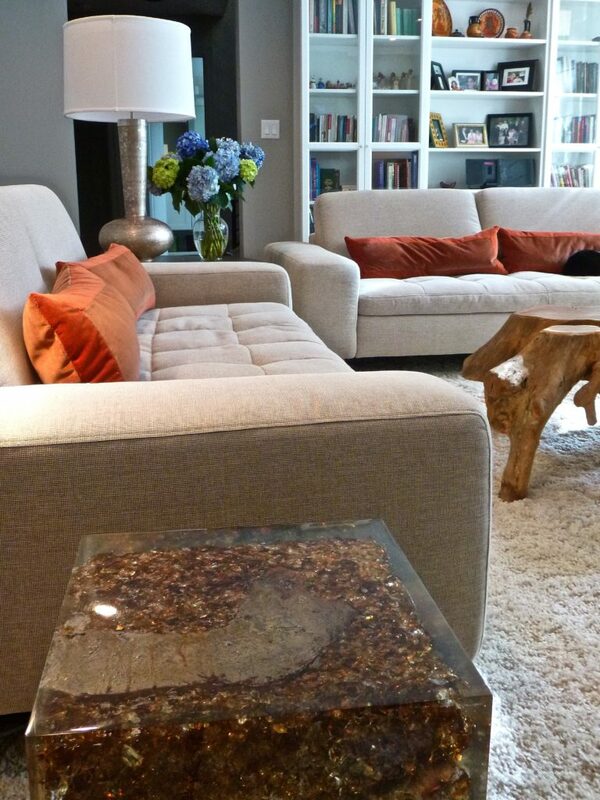 A natural teak root coffee table adds sculptural interest to the relaxed living space. 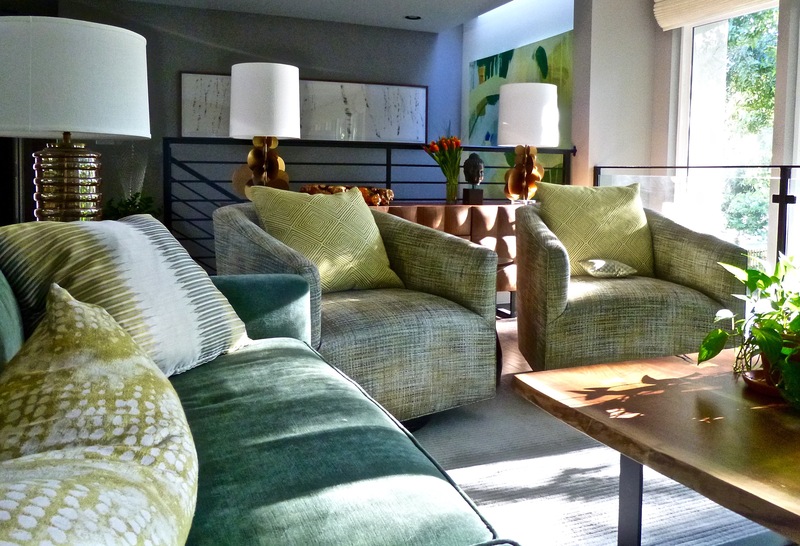 The seats of two contemporary motorized sofas extend at the touch of the remote control becoming double chaises for lounging while watching tv or enjoying the pool garden. 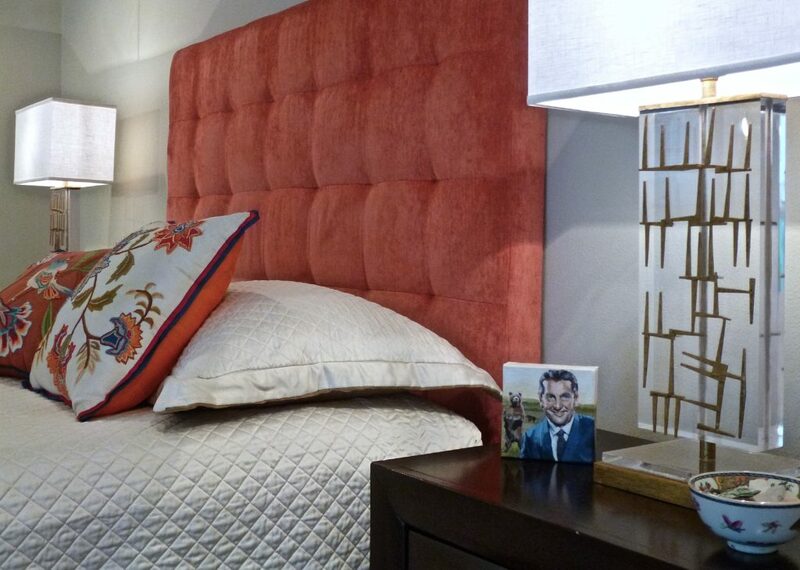 The existing Master Bedroom Furniture was brightened by the addition of a colorful headboard and Interesting lamps. 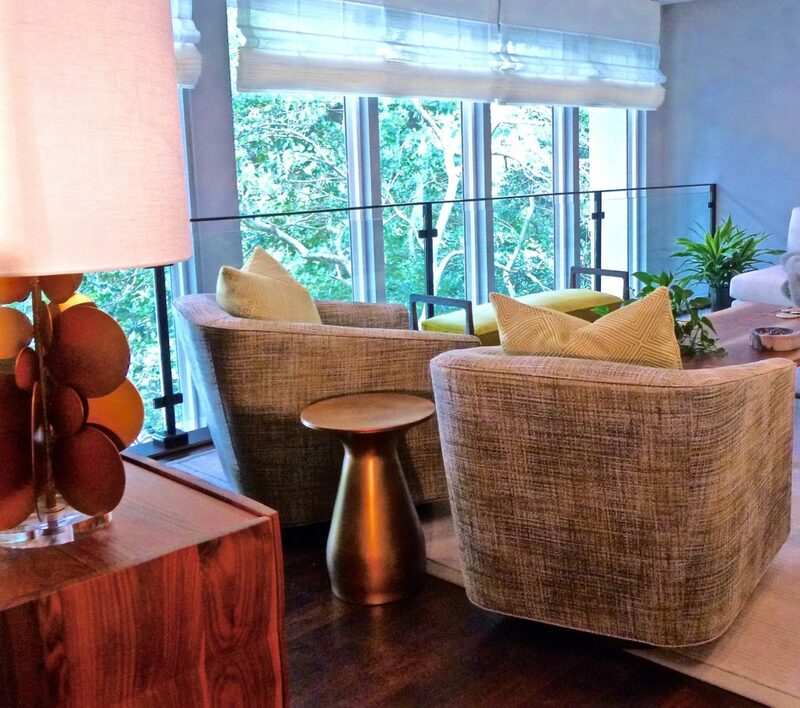 A chair and table sits by the window with sheer pleated linen shades.